When you take a regular Mercedes-Benz car and give it a fat engine, big power and lots of fancy performance bits, you get an AMG. When you take a regular AMG coupe and make it even more aggro and faster, then you get a Black Series. And four of them will be for sale very soon! At the Mecum Kissimmee 2018 auction, taking place Jan. 5 to 14, the auction house will offer a 2008 Mercedes-Benz CLK63 AMG Black Series, 2009 Mercedes-Benz SL65 AMG Black Series, 2012 Mercedes-Benz C63 AMG Black Series and 2012 Mercedes-Benz SLS AMG Black Series together, as one lot. It estimates the bunch to go between $850,000 to $1 million. This set represents every single Black Series ever made available in the U.S. to date. Mercedes has made five total, but the SLK55 AMG Black Series never came here, which, sad. With each Black Series model, you could expect huge fenders, loud noises, two doors and incredible power. They are a European take on modern muscle: power first, questions later. Having a chance at all four is a rare opportunity indeed. Sure, you could go and try to track down each of these cars individually and probably pay less than a million bucks in total. 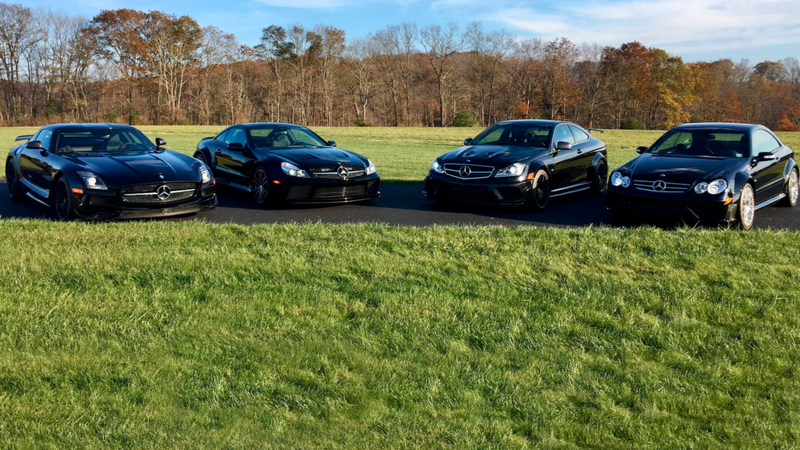 But the Black Series models on the Mecum listing also come with ridiculously low original miles: The SLS has 239 miles, the SL65 has 666, the C63 has 159 and the CLK63 has 224. Are cars meant to be driven? Absolutely. But hey! Maybe you can buy the lot and drive them around yourself until the wheels fall off.